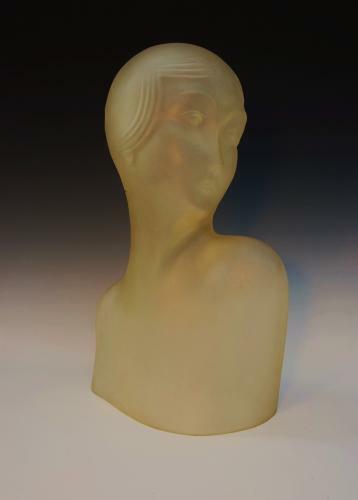 A 1920's Aet Deco French frosted glass female bust with a green/yellow tint. This is a freestanding figure, although we have also had made a mahogany base which has been ebonised & electrified which makes the piece very stylish but obviously base is not original. This looks very effective with a blue bulb lighting up the figure. We can supply a photo with base & figure lit up, if required. If purchased it would be advisable to have an electrician check the base if wishing to use it. You could also use an blue led uplighter to achieve a similar effect. The figure does have a very small hairline crack between the left shoulder & the neck, about 1.5cm in length.